At one time you could wander through the labs of pharmaceutical companies and hardly ever see light being used to mediate chemical reactions. Now "photoredox catalysis" has become an essential way to synthesize novel organic compounds. This type of chemistry may soon be used even more widely—and less expensively— thanks to University of Rochester researchers. 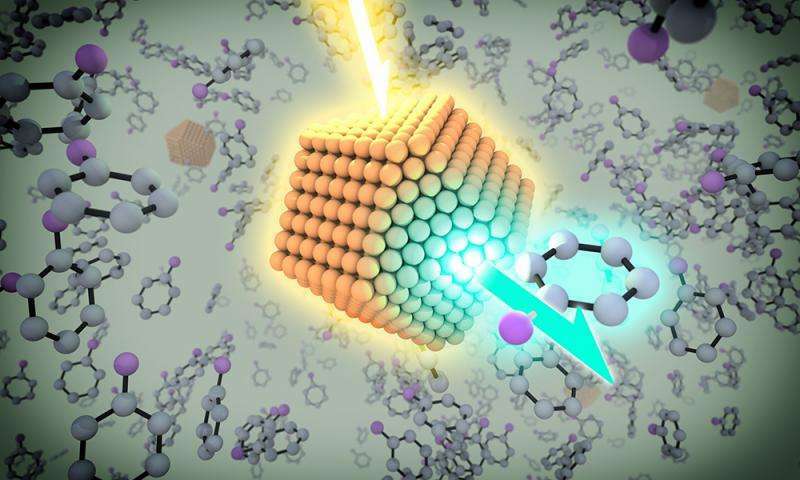 In a paper published recently in the Journal of the American Chemical Society, the labs of Todd Krauss and Daniel Weix demonstrate for the first time how light emitting quantum dots can be used as photoredox catalysts to create carbon-carbon bonds. Moreover, the researchers— including Jill Caputo '16 (PhD) and Norman Zhao '17 from Weix's lab and Leah Frenette '14 (MS) and Kelly Sowers '16 (PhD) from Krauss's group—showed that quantum dots create these bonds just as effectively as the rare-metal catalysts now used in photoredox chemistry, such as ruthenium and iridium. "The potential impact could be great," says Weix, an associate professor in the Department of Chemistry. Carbon-carbon bonds are the basic building blocks for numerous molecular forms, many of them essential to biological functions. The quantum dots have potential applications in the synthesis of pharmaceuticals, fine chemicals, and agro-chemicals. "These are markets where people are most actively searching for chemical compounds with new properties," Weix says. Quantum dots are tiny semiconductor crystals. Containing some thousands of atoms, they "live in a world between bulk minerals—like a chunk of rock, with billions upon billions of atoms—and a single molecule with only 10 or 20 atoms," says Krauss, a professor of chemistry and chair of the department. But, he adds, "quantum dots have properties of both the molecular and the macroscopic world." For example, a quantum dot has the chemical and photo stability of minerals, but has a layer of organic molecules on the outside that "allows it to be manipulated just as you would manipulate small molecules in solution. You can spray them, you can coat them on surfaces, you can mix them, and do all different chemistries with them," Krauss says. Until now, most chemists have studied quantum dots for their basic properties, with applications primarily limited to displays such as televisions. This particular discovery originated in prior work at Rochester that demonstrated quantum dots could be excellent catalysts for creating hydrogen-hydrogen bonds for solar fuel applications. For this study, Krauss and Weix tested the effectiveness of cadmium/selenium (CdSe) quantum dots in creating carbon-carbon bonds by using five well-known photoredox reactions. They found that a single-sized, easily made CdSe quantum dot could replace several different catalysts now used, with equal or greater efficiency. "The chemistry ranged from more simple reactions, where the quantum dot served as the sole redox mediator [sole agent transferring an electron], to reactions involving one or more cocatalysts, with a lot of reagents in the flask," Weix says. "There was a concern in the beginning whether the dots would survive in this chemical stew, but they did." Weix cautions that paper represents only a "first step towards showing you could use semiconductor quantum dots to replace other catalysts." The dots may need to be further refined to be suitable for industrial applications. But he's excited about their potential, and momentum appears to be building. He notes that concurrent with their work, colleagues at Northwestern made important strides toward improving quantum dot catalysts. Weix further pointed to related photochemical work with nanocrystaline titanium dioxide (TiO2) from researchers at the University of Ottawa and the University of Wisconsin. "We, and others, have so far looked at how quantum dots would perform in reactions that were reasonably well studied, because this is a new catalyst and we wanted to compare it to what came before," Weix says. "The next step is to look at what these things do that nothing else can do. That's the promise of the future."